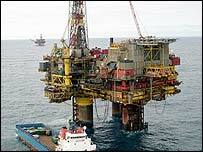 A man has died on a North Sea oil platform off the coast of Shetland. Electrician Graeme Burns, 47, died while carrying out maintenance work with a colleague on Brent Bravo on New Year's Day. The pair were in a leg when they smelled gas at 0230 GMT. Mr Burns, from Largs, who worked for the John Wood Group, collapsed and died. An inquiry has begun into his death on the platform, which is 116 miles north-east of Lerwick. Its owner, Shell, said it was investigating the death with Grampian Police and the Health and Safety Executive. The company said the smell the men detected may have been a naturally occurring gas and it did not believe there had been a leak in the platform leg. A spokesman said: "Mr Burns and a colleague were working in the utility shaft when they smelled a minor amount of gas. "One of their portable gas detectors registered the presence of gas but none of the 11 gas detectors in the shaft registered gas. "They donned breathing equipment and began to evacuate the shaft. For some reason yet to be determined, Mr Burns stopped climbing the stairs of the shaft. "He was later found unconscious. Medical assistance was applied but unfortunately he was pronounced dead. Our sympathy goes out to his family and colleagues." In September 2003, oil workers Sean McCue, 22, from Kennoway, Fife, and Keith Moncrieff, 45, from Invergowrie, Tayside, died after a sudden escape of gas when they were working inside the same utility shaft. A Grampian Police spokesman said: "We can confirm that we have officers at Brent Bravo making inquiries into the death of a crew member on that installation. "Obviously it is too early to speculate on the circumstances surrounding the death."